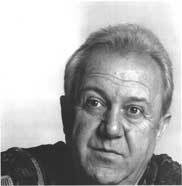 Zurab Tsereteli was born on January 4th, 1934 in Tbilisi (Georgia). In 1958, Zurab Tsereteli graduated from the Tbilisi Academy of Arts where he majored in painting. The experience obtained by the young artist in the early 1960s during his work for the Institute of Ethnography and Archeology of the Georgian Academy of Sciences was an unparalleled opportunity to study old folk art. 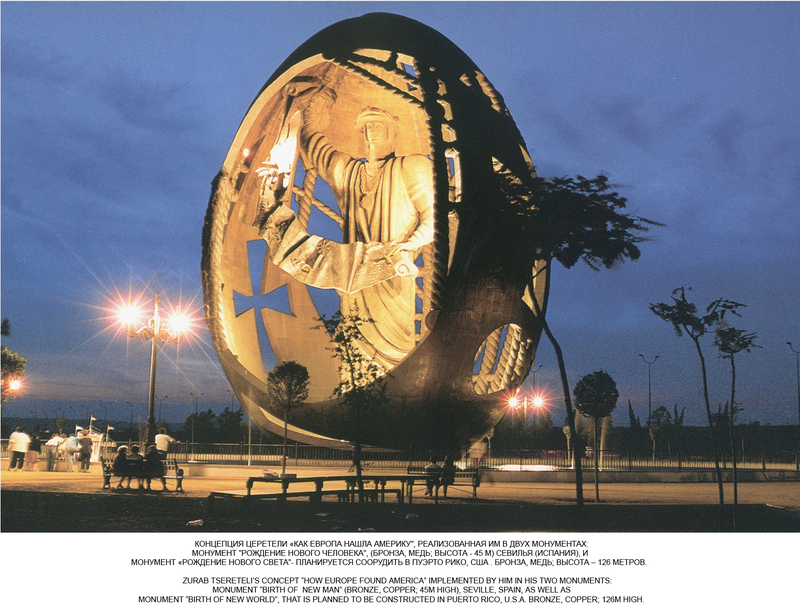 Zurab Tsereteli started out as a designer of resort complexes in Pitsunda and Adler in the late 1960s that proved his high status of the artist who brilliantly completed big monumental projects. Tsereteli's sculptural mosaics in Adler were enthusiastically appreciated by David Alfaro Siqueiros: "I think, that he has entered boundless spaces of art of the future, which combines sculpture and painting". Tsereteli produced magnificent mosaics for decoration of several public buildings in Tbilisi (Georgia). Well known is his Sea Bottom mosaic water-pool in Ulyanovsk (Russia). One of the most distinguished artist's achievements was a rebirth of the ancient technique of cloisonne enamel. The master raised the art of enamel fabrication to a higher level of quality. He enriched the color spectrum and introduced innovations in the production technology. 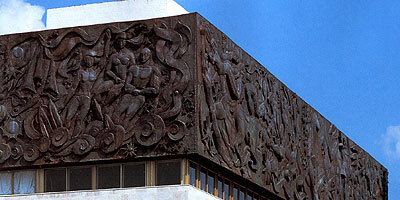 Tsereteli widely used his perfect enamel panels when he decorated the interiors of embassies of the Russian Federation in the United States, Brazil, Portugal, Japan, Syria and other countries. At the same time the artist continued his work and experiments in stained glass. Synthesis, freedom in the use of various materials and media, including such rare and labor consuming as stained glasses and cloisonne enamels contributed to his success in the design of big architectural and landscape ensembles. In the late 1970s, Tsereteli focused on his work in metal. 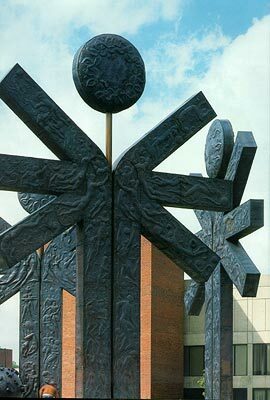 Of special interest are his huge frieze in high relief in the "Izmailovo" hotel complex built for the 1980 Olympic Games in Moscow and his "Happiness to Children of the World" monument (1979) dedicated to the Special Olympic Games in Brockport (New York, U.S.A). 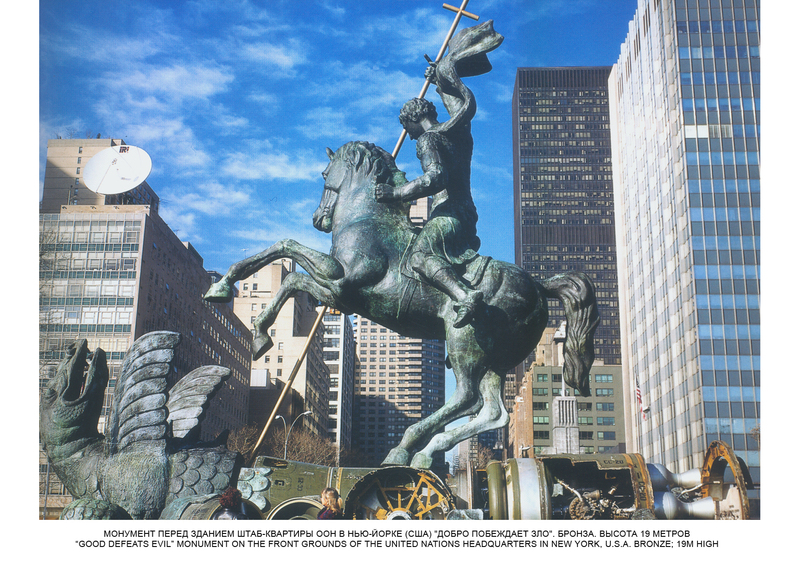 Tsereteli's public monuments can be seen in many cities throughout the world: "Good Defeats Evil" (1990) - bronze sculpture of St. George the Victorious on the north lawn of the United Nations Headquarters in New York; sculptural composition "To Break the Wall of Distrust" (1989 ) symbolizing the end of "cold war" in London, Great Britain; "Birth of a New Man" (1995) monument in Seville, Spain commemorating the 500th anniversary of Christopher Columbus's historical sail to the shores of America; monument to the Russian novelist Nikolai Gogol (2002) in Rome, Italy; statue of St. Nicholas the Wonder-Worker (2003) in Bari, Italy; monument to Honore de Balzac (2003) in Agde, France; "Holocaust" sculptural composition (2005) in Jerusalem, Israel; monument to Pope John Paul II (2006) in Ploermel, France; monument to Itiro Hatoyama (2007) in Tokyo, Japan and many others. 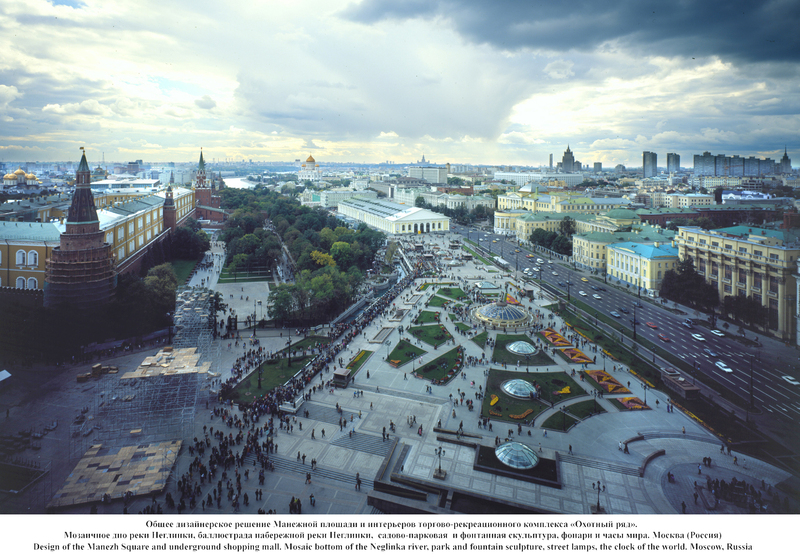 Zurab Tsereteli has made a big impact on the new image of Moscow after the collapse of the Soviet Union in 1991. 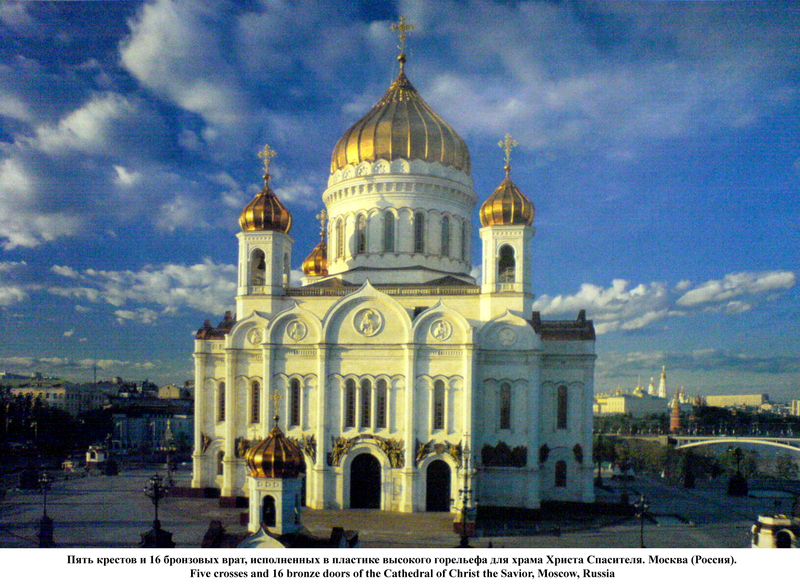 The artist has been in charge of the recreation of the exterior and interior decoration of the Cathedral of Christ the Savior (1994-1999), was a chief designer of such big complexes as a War Memorial on Poklonnaya Hill (1995), Manezh Square and "Okhotny Ryad" underground shopping mall (1997) located near the Kremlin walls. 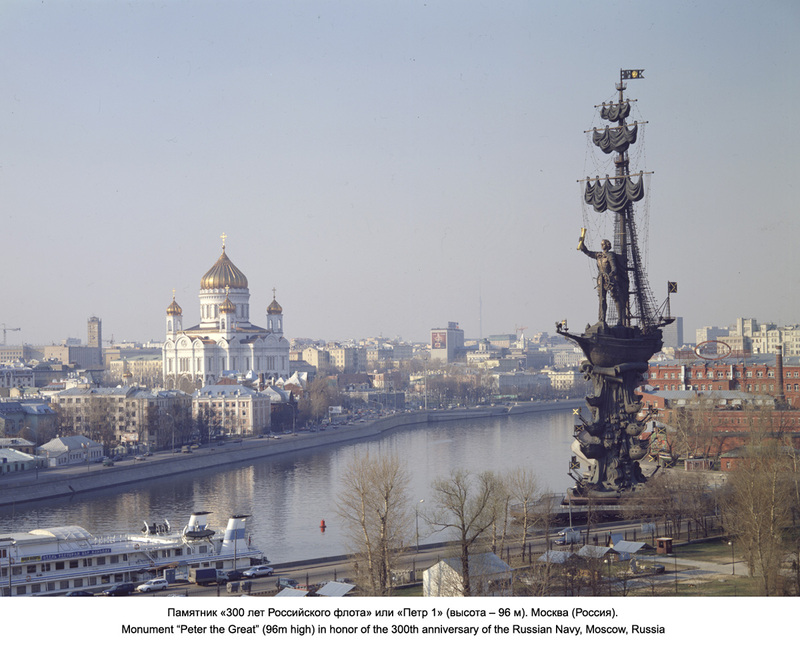 His monument to Peter 1, 94 m high, (1997) in honor of the 300th anniversary of the Russian Navy, standing on an artificial island in the Moscow-river, is one of the landmarks of Moscow. In 2005 in Moscow was unveiled his monument to General Charles de Gaulle. His expressive, plastically powerful, often full of inner tragic tension easel and memorial works of art, monumental and decorative compositions go with his works on genre and everyday topics. His searches for monumental images of generalized content have resulted in the creation of almost abstract easel sculptures and huge symbolic monuments containing both a general philosophical meaning and the artist's reaction to major events. 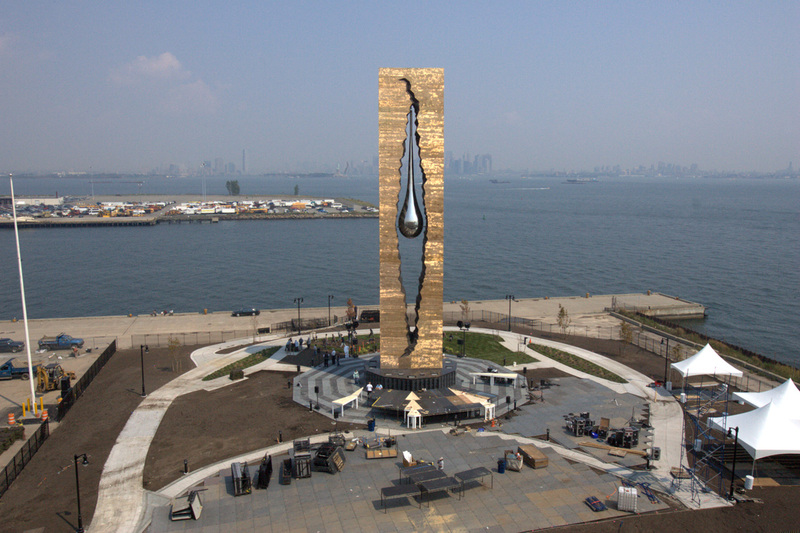 In the city of Bayonne (New Jersey, United States) on the fifth anniversary of the September 11, 2001 terrorist attacks there was a dedication ceremony for Tsereteli's 175-ton sculpture entitled "To the Struggle Against World Terrorism" consisting of a 100-foot tall rectangular bronze block with a fissure down the middle creating the tension and drama of the sculptural image, in which a teardrop in memory of those whose lives were lost is suspended. Nine pathways lead to the 11-sided granite base where names of 9/11 victims as well as victims of the 1993 World Trade Center bombings are engraved. The artist is very prolific in painting. In his pictures he always shows his own particular view of life, his fervent temperament and passionate striving for new artistic discoveries. His canvases, portraits, still-lives are characterized by sensitive individuality of images, deliberate deformation of the nature, "juicy" and plastic manner of painting. Tsereteli's palette is expressive, his brushstroke is not simply thick and rich, he molds colors with his brush, thus creating a plastic texture. In the artist's monumental and easel works one can sense clearly themes common to all the people in the world, his devotion to the ideals of peace and tolerance attesting to the diversity and breadth of his vision. In 1996 Zurab Tsereteli was designated UNESCO Goodwill Ambassador. Internationally recognized he is a Corresponding Member of San Fernando Royal Academy of Fine Arts (1998, Madrid, Spain), a Corresponding Member of the French Academy of Fine Arts (2002, Paris, France), a distinguished visiting Professor of Arts at the State University of New York, College of Arts and Science at Brockport (1978, Brockport, New York, USA), a Full Member of the European Academy of Sciences and Arts (2009, Austria). Since 1997 till now Zurab Tsereteli has been a President of the Russian Academy of Arts. In 1999 Tsereteli established a Moscow Museum of Modern Art, the first one in Russia dedicated to modern art, and donated his private collection of the 20th century works of art that is now a strong component of the Museum holdings. Tsereteli Art Gallery (2001) adjoining the Russian Academy of Arts in Moscow provides exhibition space of more than 10000 sq. m. On display is a permanent exhibition of Tsereteli's works, including his paintings, sculptures, graphic art, enamel panels and bronze miniatures. Of special interest is the master's unique series of bronze sculptural portraits of prominent figures of Russian culture of the 20th century entitled "My Contemporaries". The Gallery's atrium presents a big exposition "Good Defeats Evil". The focus of the atrium is a huge bronze apple, inside which visitors can trace the history of human passions from the Fall. Around the perimeter the walls are decorated by Tsereteli's monumental reliefs on Biblical topics depicting the spiritual rebirth. The artist's latest monuments "Night at the Ipatiev House" (2007) commemorating the assassination of the last Russian tsar's family and "Wives of the Decembrists. Gates of Fate" (2008) are also on show in Tsereteli Art Gallery. Zurab Tsereteli has been honored with numerous awards including an order "For Services to Motherland" 2nd rank (2006, Russia), Order of Bernardo O' Higgins in the highest rank of Grand Cross (2007, Chile), UNESCO Picasso Gold Medal (2007), Officer of the Order of Arts and Literature (2005, France), "Tree of Life" award by Jewish National Fund (2005, New York, USA), Order of Gabriella Mistral (2002, Chile), Honorary Cross "Combattant Volontaire" of the Association of Veterans of the French Resistance (2000, France), "Vermeil Medal", the highest reward of the city of Paris and the "Big bronze medal of Paris (1998, France), the State Prize of the Russian Federation(1996)), the order "Friendship of Peoples" (1994, Russia), the gold star of the Hero of Socialist Labor (1991, USSR), the USSR State Prize (1978, 1983), the Lenin Prize (1976, USSR) and others. The People's Artist of the USSR, Russia and Georgia Zurab Tsereteli is a philanthropist who generously donated his artworks to charitable auctions and hospices.